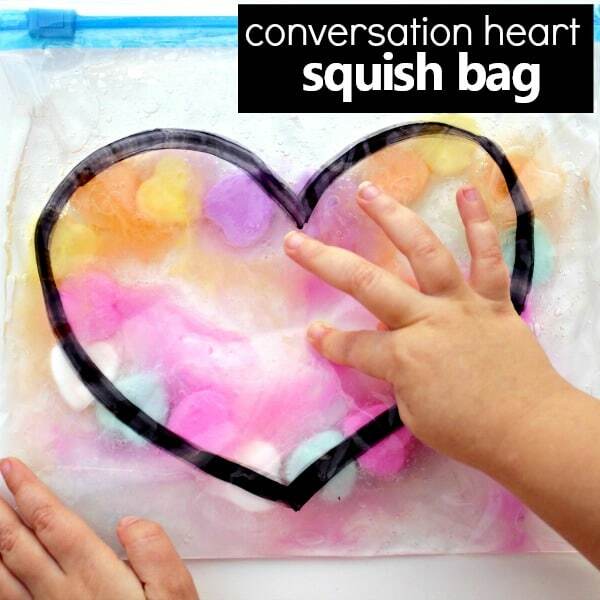 You may have already noticed by now that we love sensory squish bags around here! 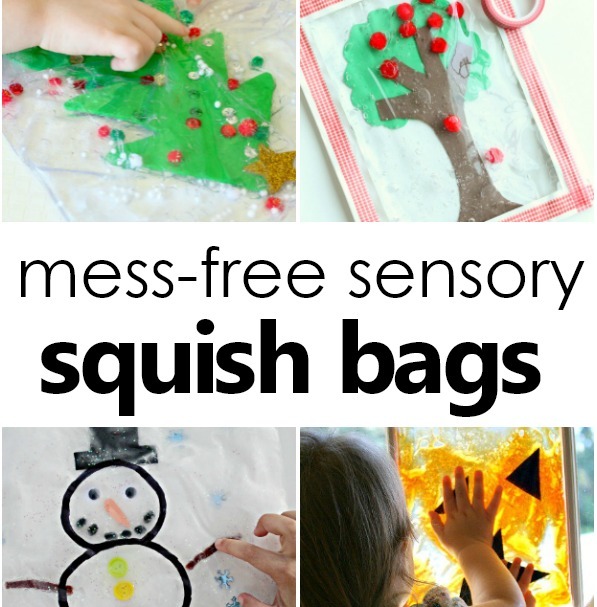 They’re the perfect mess-free quiet time sensory activity. 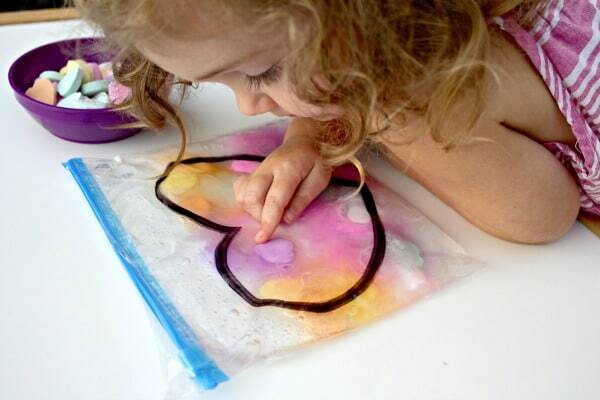 We love to pull them out to explore, especially when those little hands need to be occupied! 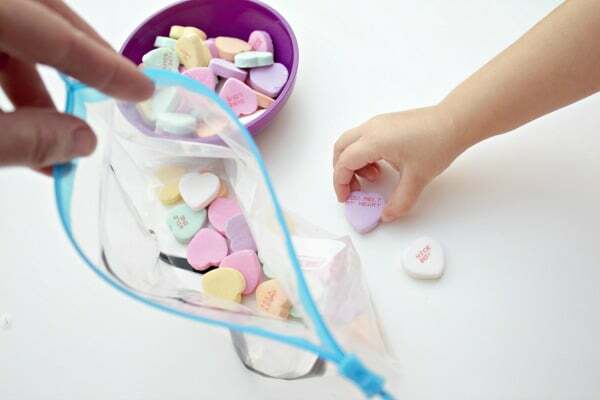 To celebrate Valentine’s Day, we created a conversation heart squish bag. 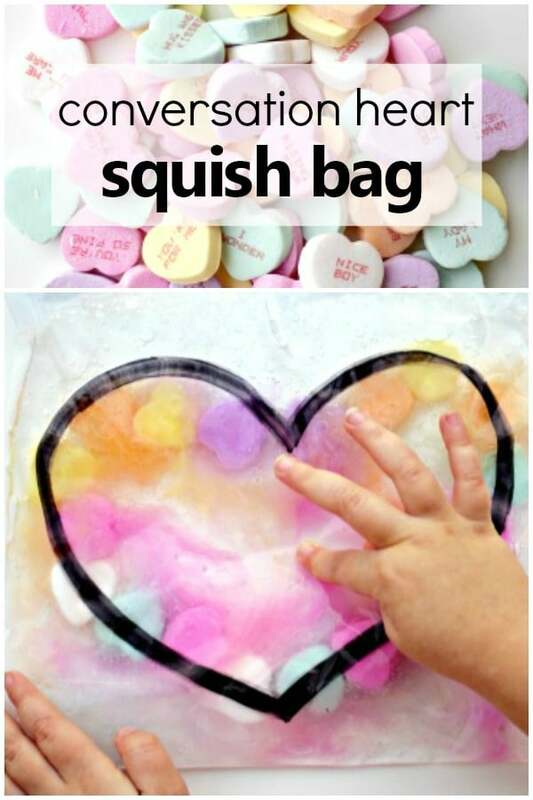 This Valentine’s squish bag turned out to be a fun science observation as well- take a look! 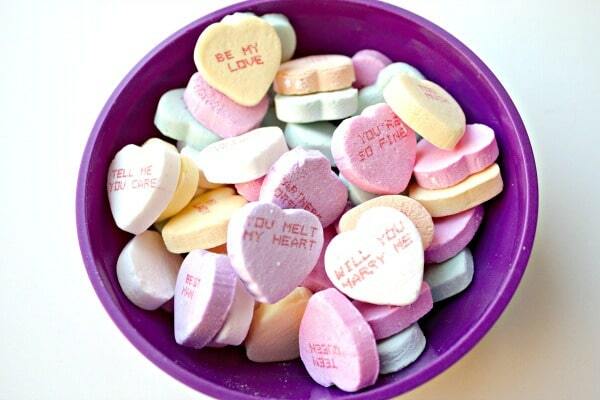 Nothing expresses Valentine’s Day quite the way conversation hearts do. Growing up, I remember the feeling of handing them off to friends or even crushes. I must admit, it was fun and somewhat nostalgic introducing these sweet little treats to my girls. 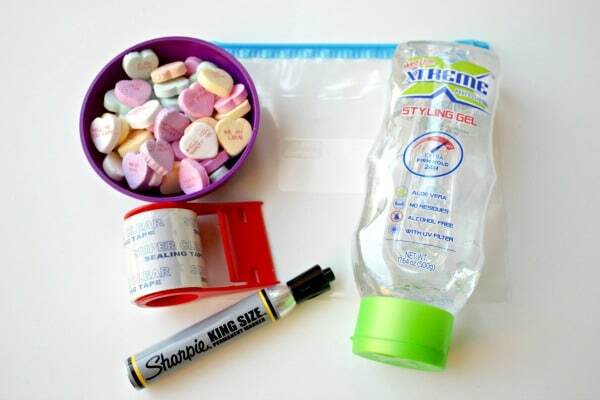 To get started, I drew a heart shape onto the bag with a permanent marker. Using our fine motor muscles, we grabbed each heart and began to fill the bag. It was fun to read some of the messages aloud as we filled the freezer bag. My kindergartner was excited to read some of the sight words she recognized! Next, we squirted about half a bottle of clear hair gel into the bag and did our best to move the air pockets to the top of the bag. 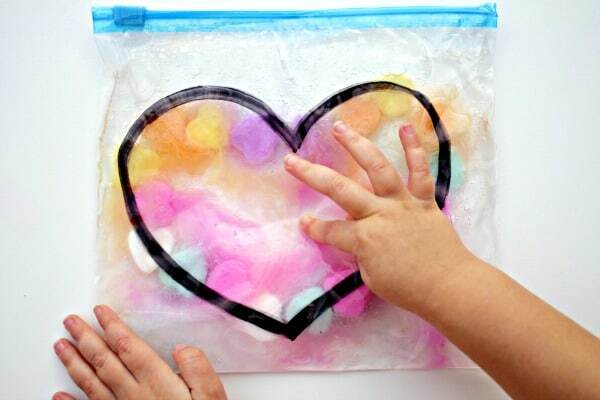 We recommend sealing the bag with packing tape once you are done filling it with your ingredients. This will keep the hair gel from seeping out. Now it’s time to let those fingers start squishing! 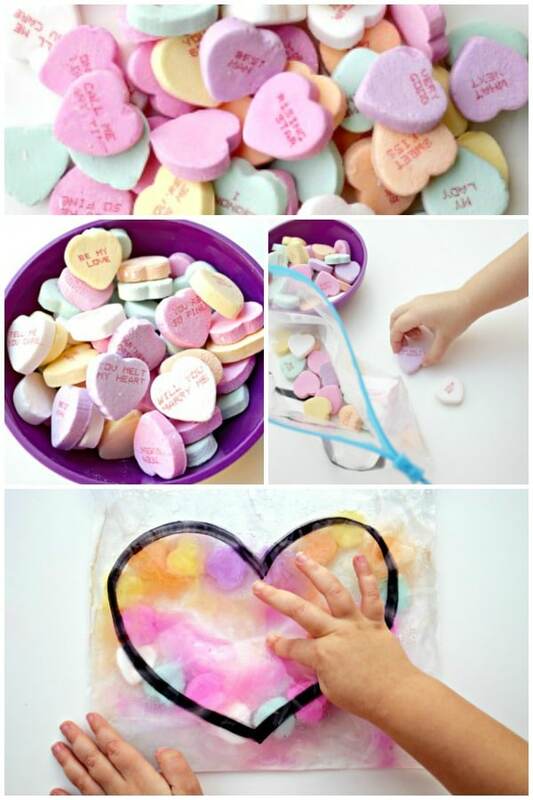 We had fun squishing and sliding the colorful candy hearts around the bag. The heart outline was used to follow as a guide to line the hearts up around it. 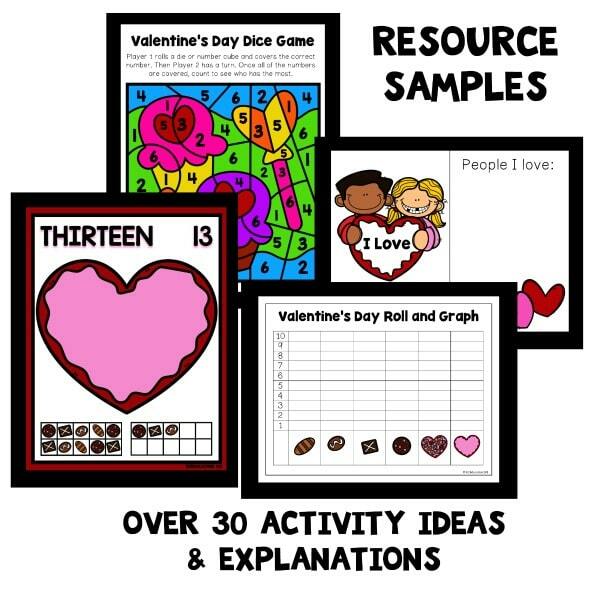 An idea was also sparked to fill the inside of the heart up with the conversation hearts. It was almost immediately observed that the red writing on the hearts was disappearing! 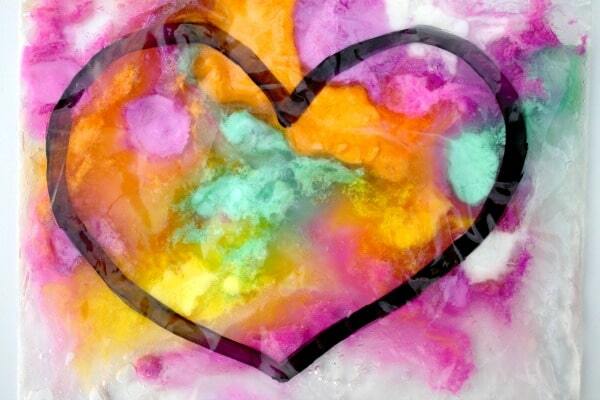 Slowly but surely, the candy began to dissolve and the colors spread throughout the bag. This prompted an investigative science “project.” After squishing and playing for a little longer, we decided to let the bags sit for a few days. We wanted to know how long it would take to for the heart candies to completely dissolve. 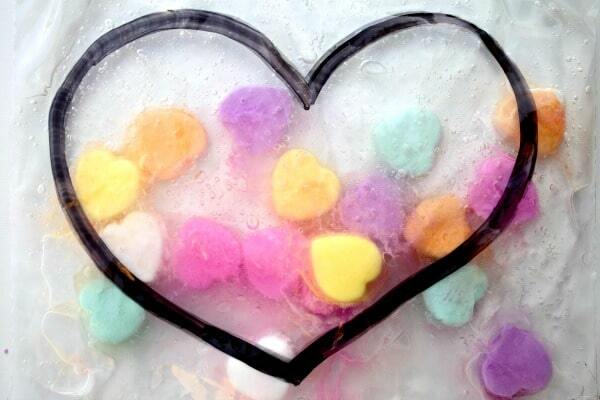 On day three, we poked and prodded the conversation hearts, and sure enough, they were no longer a solid substance. 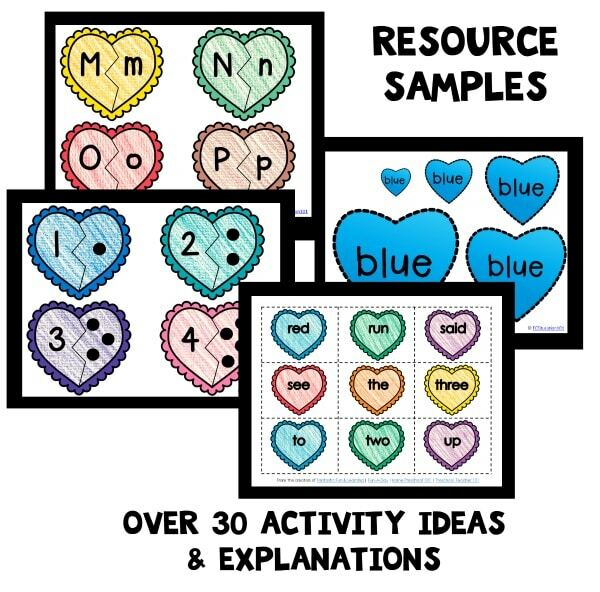 If you would like to explore this fun Valentine’s heart squish bag with a non-food item version, try substituting some conversation foam hearts for the candy hearts. It will definitely keep the fun going!